Here we have the first painting i did on my new machine. I had the actual cave background plate render on my disk for a while now and used this project to see what the new machine can do. I’m pretty happy with the results i got from this project. Computer speed wise as well as painting result wise. I really used Vue a lot here to render out different elements for the background and foreground. 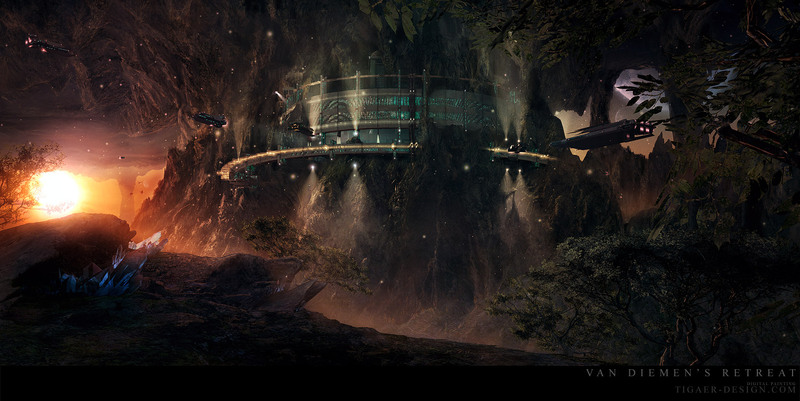 The crystals, ships and trees were implemented with help of multipass rendering. Due to the speed of my new machine i finished the painting in a very good time. This is a painting that, after lots of storyless pieces, has a story again. Some of you might know that U2 song ‘Van Diemen’s Land’. One of the most beautiful songs ever btw. In fact i listened to it when i was looking for a painting title. I always liked that name ‘Van Diemen’ and used it here. Now lets say this base we see here is some sort of hidden pirate base. Hidden within some sort of planetoid/super asteroid. A rock large enough to develop some sort of atmosphere where plants can grow. But only on the inside caves of the asteroid. On the surface you’ll find plain death. Downcrashing asteroids. Deadly subeams. Extreme temperatures. Due to a special magnetic field the base cannot be spotted. You can only get there with the right coordinates! The base was once founded by a space pirate legend named (you guess it) Van Diemen. After one of his biggest coups he had to flee before a huge fleet that tried to hunt him down. His last chance was to hide in an asteroid field! He and his men made the brave decision to hide within an immense large weird splitted/cracked open rock, carefully maneuvering his massive ship, while the fleet searched everything for him. Soon he started to wonder why they did not pick up the energy signature of his ship and found out about the specialty of this place. He started to make plans… to build a hideout! That was 200 years ago. Now this place became a massive outpost for all sorts civilizations. The place now is named after its founder but it’s no more a place for criminals and other scum of the universe. It’s still very tricky to find this base and even with automated landing procedures there happen accidents every now and then. So when you plan your trip there… better pay some extra for a good ship and an even better captain! Plate can be found here. Print detail can be found here (Large file). This entry was posted on Tuesday, March 31st, 2009 at 16:06	and is filed under Paintings. You can follow any responses to this entry through the RSS 2.0 feed. You can leave a response, or trackback from your own site.